The dress fabric is so fab. And her wee face. And her bunny feet (are you sure they’re bunny feet? They look like cat legs to me…). oh Hillary, sorry, but that is so funny. She is perfectly adorable though. Your fabrics, as always, are lovely. MY kitty has feet just like that! so i think your kitterkatter’s little feet are JUST FINE. Oh, she’s adorable, even with the bunny feet! I adore the cross-backed dresses you make! may i have a dress just like that one, please? I love her bunny feet and all! You have such an eye for patterns that work together. Gotta tell you, Hillary, your kitty with bunny feet made my day. Thanks for the post. A bunny-kitty lovechild. How sweet. Tell Tim he’s got it wrong, dogs and cats have very high (on their leg) ankles. I know because my little puggy broke hers a few years ago. Of course their pads don’t go all the way up to their ankles so he has something there. Regardless, she is super sweet, I love the dress. That style has always been my favorite top/dress for my daughter and the fabric is smashing. The trees bring out the gold of her eyes. 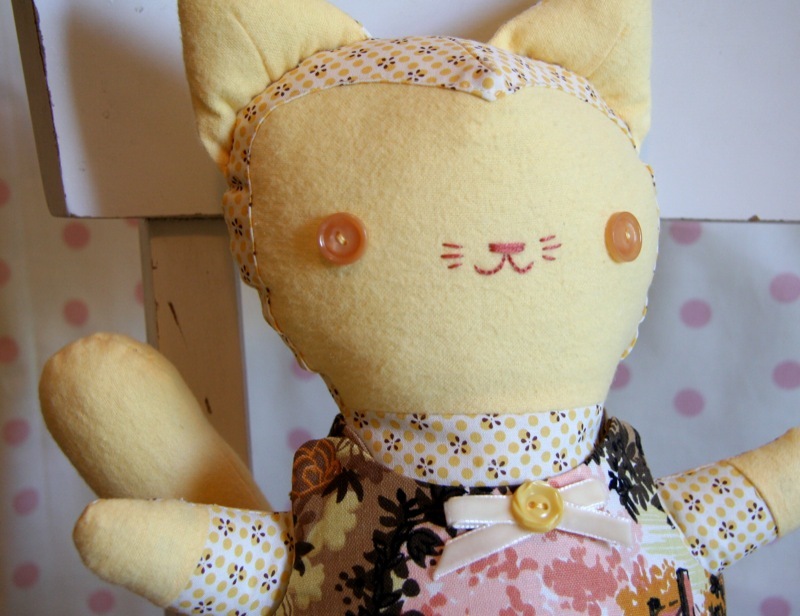 Love the bunny feet I mean kitty paws:) Great pattern can’t wait for the book. I like Kitty with the bunny feet! I think the feet look just dandy. Honestly, cats *have* big back feet, don’t they? They just don’t all touch the ground when they walk or something. Really. My Mina has dainty front feet but she’s got honkin’ back paws…. I think she’s adorable, bunny feet or no! It is very cute hillary! And I wouldn’t have noticed the feet thing at all. Her face is sweet and the dress is SO nice. This is my kitty (Bugs). He’s a Manx, so he naturally has a bunny tail and bunny feet. the crossbreeding works for me, cute! I reckon she is perfect! My real cat has feet like that. My brother always laughs at her funny, furry rabbit feet! This is adorable! I love the dress fabric! It reminds me of Maine. I think our family friend from Maine had a couch in that material. Looks better as a dress! This is a very pretty kitty. I love the dress fabric and her face is soooo cute. I won’t lie — those do look a bit like bunny feet, but the sheer cuteness of the rest of her totally distracts you from that one itty bitty thing. Plus, I think she’s darn cute as is. I say keep the bunny feet! oh my stars!!! this might be my most favorite, hands down!! ack!! Cat feet are just like that! Try getting them to fight you with their back feet and see! I love, love, love the bunny feet! I think it adds a little panache! Darling! Love the color scheme. I have a question for any of you stuffed toy experts. how do you get your toy to not look all puckered around the seam lines? Mine are very puckery. Is it how tightly/smoothly you stuff them? the tension or length of stitches of the seam? the type of fabric? just plain practice? argh. I might even like her more with bunny feet – I mean, think about that old “Rudolph, the Red Nosed Reindeer” Christmas special – who were your favorite characters from that? The toys from “The Land of MisFit Toys”, right? Just imagine BunnyKitty hanging out with the Charlie in the Box…. If they’re bunny feet, than my cats must be bunnies. They’re perfect likenesses of cat hind legs! The dress is really fabulous! Very nice!! And I love the outfit, I was thinking about making a smock for myself just like that!! Oh, she’s purrfect! 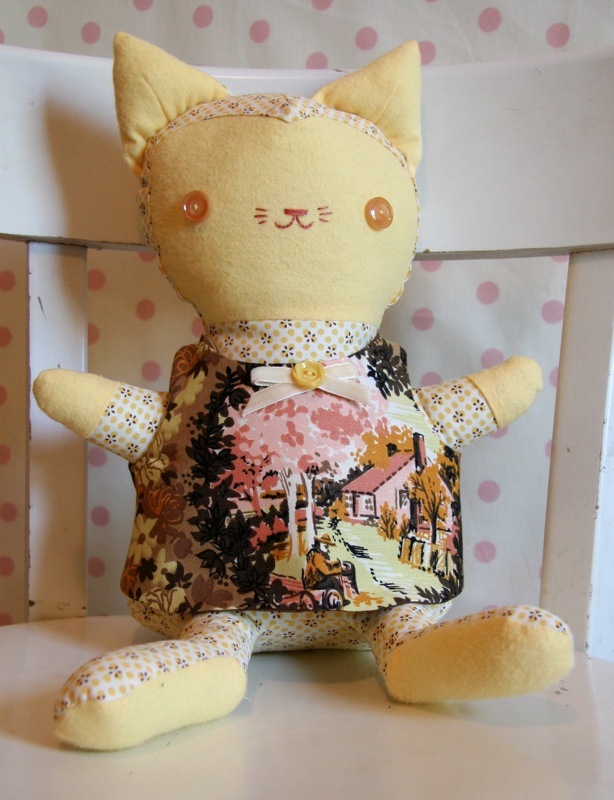 The colors are so soft and sweet… a darling butter cream kitten. Who could resist her! haha, that is great work! and cats DO have ancles like that! I want to make one too! She is so lovely! Her tail looks a bit like a squirrel’s too.